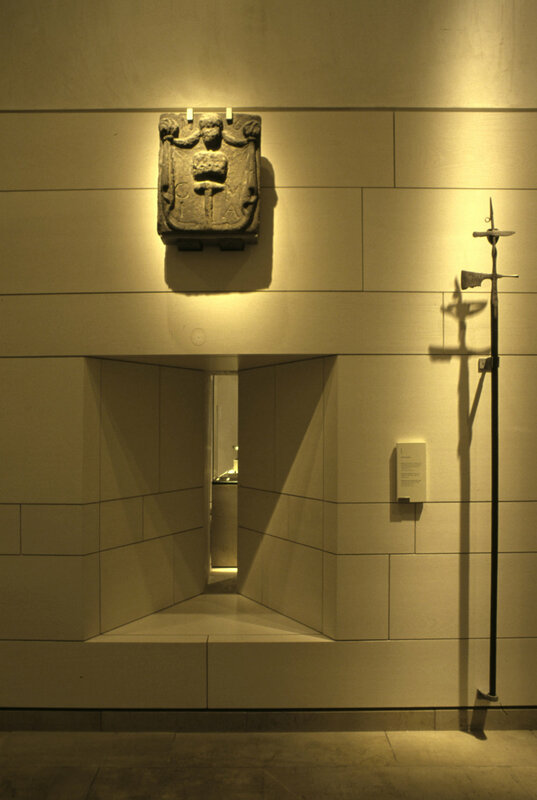 The goal at the National Museum of Scotland was to provide conservation and display lighting for permanent displays while articulating the building architecture within pre-defined architectural infrastructure using the language of track and downlight positioning. The overall scheme required ease of maintenance using common lamp types for as many fittings as possible. The selection of fittings addresses the tendency for low-skilled maintenance staff to be employed for lamp changing. The project had substantial public interest with an exact programme deadline of St. Andrews Day 1998. The general approach is of wall washing the architectural form at a level where highlighted objects have a sufficient yet subtle contrast against ambient light levels. In this gallery this is accomplished by utilising a regimented grid of down lights alternating between spots and wall washes all using AR111 lamps. In the majority of galleries with tracks, a common family of track fittings are used again with AR111 lamps. These were developed in response to a tight performance specification including the ability to re-lamp the fitting without changing the focus of the fitting that also required solid lock-off. The fittings also provided for a selection of lenses and lamps up to 100W. The building exhibits a complex architectural layering with penetrating vistas relating to the sequence of objects. This language informed the process of lighting exhibits and spaces to allow continuous lighting balance through the key vistas. Case lighting throughout is by Fibre Optics. Standardised case soffit profiles were developed to conceal the fibre fittings while allowing full articulation in order to enable objects and graphics to be lit appropriately. Wall wash levels are controlled to prevent excess light entering the case and disturbing the internal balance and conservation lighting levels. Fibre optics are also used in the “Mediaeval Church” concrete soffit creating a dramatic contrast to the lighting elsewhere describing the intimate feel of the buildings where the displayed objects were originally found. Light is used to create dramatic links between areas and objects such as the long shadow of the beheading machine and the coffin. Throughout the building views to daylit spaces provide orientation and connection with the outside world. Lighting in these areas responds to the daylight in the spaces beyond.